Probiotics are defined as "live microorganisms that confer a health benefit on the host when administered in adequate amounts". Prebiotics are defined as "selectively fermented ingredients that result in specific changes in the composition and/or activity of the gastrointestinal micro biota, thus conferring benefit(s) upon host health." As quoted in the 2011 Global Guidelines by the World Gastroenterology Organization - Probiotics are defined as "live microorganisms that confer a health benefit on the host when administered in adequate amounts". Prebiotics are defined as "selectively fermented ingredients that result in specific changes in the composition and/or activity of the gastrointestinal micro biota, thus conferring benefit(s) upon host health." The definitions suggest that there are several distinguishing features to tell prebiotics and probiotics apart, which include functions, sources, as well as health benefits. 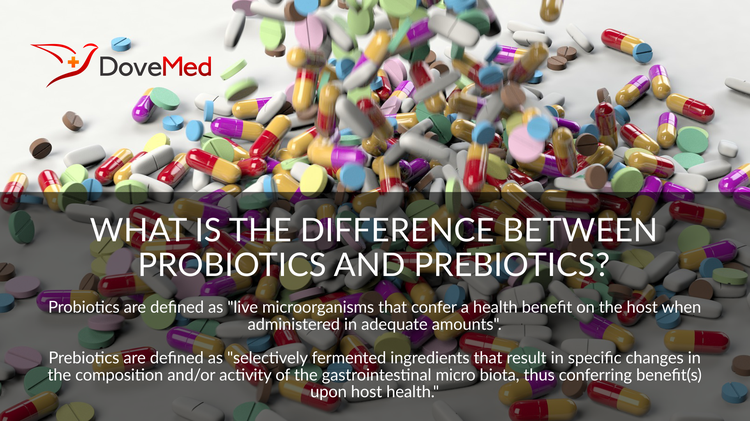 The major difference between the two is that prebiotics are not live microorganisms while probiotics are. Prebiotics form feed to the healthy bacteria present in the gut and may be present naturally in foods, while probiotics are live microorganisms (such as; Lactobacilli, Bifidobacteria, and Staphylococci) that are incorporated in foods or medications to serve a remedial purpose for specific health issues. Hence, prebiotics encourage enhancement of the function of good bacteria in the body that in turn boosts the body’s immune response and increases bioavailability of minerals. Legumes, whole wheat products, rye-based products, banana, garlic, artichoke, asparagus, shallots and onions are among the good sources of prebiotics. Prebiotics are primarily a natural part of fruits and vegetables. Probiotic agents are usually incorporated in fermented food products or supplements like fermented milk, ferment soy products, kefir, yoghurt, and many others. The use of probiotics suggests that it can work in place of several medications or supplements; however, guidelines for dosage prescriptions are not formulated for probiotics yet. This is a distinguishing factor from that of prebiotics, which are natural nutrients that can be consumed rather liberally. A 2009 study by Boyle and co-authors concluded that probiotics may help treat eczema. Yang and co-authors in 2013 also proved through a study that probiotics are beneficial to prevent allergic rhinitis. Likewise several other studies have been investigating the advantages of probiotics in prevention and/or treatment of urinary tract infections, colic in infants, bacterial vaginosis, and non-alcoholic fatty liver disease. Prebiotics are also being subject to much research. A popular study by Kellow and co-authors in 2013, described the positive role of dietary prebiotics in prevention of type 2 diabetes mellitus. Sauer and co-authors as well found that prebiotics aid in reducing risks of colon cancers through their research study way back in 2007. Prebiotics have presented several metabolic and cardiac associated benefits in most other studies. A study by Solki and team conducted in 2014 however cautions that prebiotics and probiotics requires further research and probiotics over a certain consumption level may cause sepsis. Hence, they must not be used for clinical trials yet and must be avoided in severely immuno-compromised patients. However, prebiotics and probiotics continue to exist in food products and have made their way to market shelves comfortably. The best results are usually observed when prebiotics and probiotics coexist as a synergistic pair to function through the diet in the human body. The scientists and food industrialists have loads to explore in prebiotic, probiotic, and symbiotic food sections. Tomasik, P. J., & Tomasik, P. (2003). Probiotics and prebiotics. Cereal Chemistry, 80(2), 113-117. Shah, N. P. (2004). Probiotics and prebiotics. Agro Food Industry Hi-Tech. Farnworth, E. R. (2002). Probiotics and prebiotics. In Handbook of nutraceuticals and functional foods (pp. 412-427). CRC Press. Klaenhammer, T. R. (2007). Probiotics and prebiotics. In Food Microbiology: Fundamentals and Frontiers, Third Edition (pp. 891-907). American Society of Microbiology. Wollowski, I., Rechkemmer, G., & Pool-Zobel, B. L. (2001). Protective role of probiotics and prebiotics in colon cancer–. The American journal of clinical nutrition, 73(2), 451s-455s. Gibson, G. R., & Fuller, R. (2000). Aspects of in vitro and in vivo research approaches directed toward identifying probiotics and prebiotics for human use. The Journal of nutrition, 130(2), 391S-395S.